Have you ever needed to memorize text and still managed to fail no matter how hard you tried? Maybe it’s not your brain that’s at fault, maybe it’s your method! Even if repeating something over and over works for you, it’s not the best way. Now you can learn and memorize faster using today’s discount promotion, quick Memorizer! quick Memorizer trains your brain to recall text in different ways, strengthening your ability to memorize and recall speeches, written passages, poems, and more. An array of tools lets quick Memorizer build your brain’s ability to recall text from a number of different angles, thus creating a comprehensive ability to memorize words. How does quick Memorizer work? Well, you can opt to show the entirety of each word, so you can familiarize yourself with an entire passage. Then use quick Memorizer to show only the first letter of each word, or the first letter and a number of blank spaces. The program can cover text, and even scramble words. The point is, once you’ve mastered each approach to memorizing your passage, chances are good you’re going to be able to recall it easily! 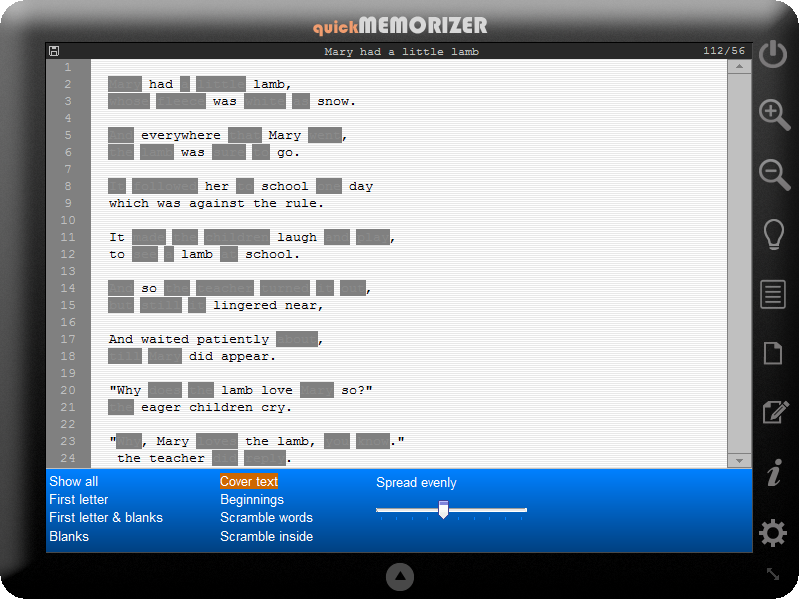 After you purchase quick Memorizer it may be used indefinitely. Stephen Warkentien VirusTotal.com says that the trial version has no problems. Two of the scan engines on Virustotal.com flag the paid version as suspicious. Alexander User I can asure you that it has no virus inside. I'm the author I know. You will have to choose who to trust me or Virustotal.com. Noggin The Nog What in terms of functionality is the difference between the program installed by the installer downloaded after purchasing a licence, and the program installed by the trial installer?